After reviewing the undercover footage, Dr. Bernard Rollin of the Animal Sciences Department at Colorado State University stated: "From the moment that the chickens are dumped from trucks to a conveyor belt in large groups, surely terrifying, and then hung upside down by their feet, we can be morally certain that the animals are experiencing significant fear. … Still hanging by their feet, the birds are transported to a stunning electrical bath, which is supposed to render them insensible, before they are cut up by a mechanical knife. It is evident from the video that many animals are still conscious when this occurs. … Conversation among workers on the video confirms that a significant number of birds are conscious even when they are immersed in a scalding tank." Dr. Sara Shields, a research scientist and consultant in animal welfare with a doctorate in animal behavior from the University of California, reviewed the video and concluded: "The slaughter of poultry in the United States is in dire need of reform. Transport, unloading, shackling, stunning and slaughter itself are all sources of significant physical and psychological trauma." Broiler chickens, the breed typically used for meat, have been bred to grow obese so quickly that many of them become crippled under their own weight. Unable to walk, many die of dehydration when they can’t reach water. Others die from heart attacks, organ failure, and other obesity-related causes. High levels of ammonia due to the filthy factory farm conditions also lead to severe skin and throat irritations, blindness, and deadly respiratory problems. At the factory farm we investigated, hundreds of birds die every day from the diseased and unsanitary conditions. Those who survive are carelessly grabbed by their legs, wings, and necks and violently slammed into transport crates. Many of the birds have their wings or heads closed in the cage doors, causing severe pain and injury. The birds are then shipped through all weather extremes to be slaughtered. Chickens are typically only 42 days old when sent to slaughter. Despite their enormous size, they are clearly baby birds, as they still peep like chicks instead of clucking like chickens. At the slaughterhouse, terrified and exhausted chickens are dumped out of their crates, and workers quickly hang them upside down in metal shackles. This brutal process causes many of the birds to suffer from broken legs and wings. Once in the shackles, the birds are dragged through an electrified water bath meant to paralyze them, not render them unconscious. This means that chickens are still completely aware when their throats are cut. Because of the fast pace and sloppy nature of the slaughter process, many of the birds miss the blade and go into the scalding water tanks while still conscious and able to feel pain. At this particular Chick-fil-A supplier, workers estimate that as many as thousands of birds are scalded alive each week. The USDA reports that more than a million chickens are scalded alive at slaughterhouses every year in the United States. If even one dog or cat were scalded alive, these slaughter plants would be shut down and their operatives charged with criminal cruelty to animals. 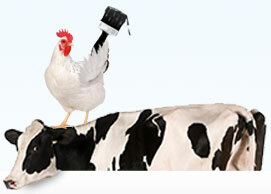 But Chick-fil-A’s suppliers get away with scalding to death tens of thousands of birds each and every year. Although unconscionable cruelty and violence are standard practice for Chick-fil-A suppliers, caring consumers can help end the needless suffering of chickens and other farmed animals by choosing vegan alternatives to meat, milk, and eggs. Please visit ChooseVeg.com to learn more.